Focus Max Two™ is a unique supplement combining the health benefits of Vitamin B12 (as methycobalamin, phosphatidylserine, ginkgo biloba, and lecithin to form one great product. Methylcobalamin is the most active form of vitamin B12. We at Maxi Health Research® include methylcobalamin as opposed to cyanocobalamin since methylcobalamin is active immediately upon absorption. Cyanocobalamin must be first converted to methylcobalamin by the body. Ginkgo Biloba is a well-known herb whose active agents show strong anti-oxidant activity helping to reduce free-radical damage. We at Maxi Health Research® use the standardized form of Ginkgo Biloba offering you a more potent, stable, and pure product. Lecithin is a fat-like substance known as phospholipids and is a superior source of the B vitamins inositol and choline. Phosphatidylserine is a major phospholipid in the brain and increases the neurotransmitters, acetylcholine and dopamine. Acetyl L Carnitine is an amino acid. It functions as an antioxidant and promotes the production of glutathione, a free radical scavenger. 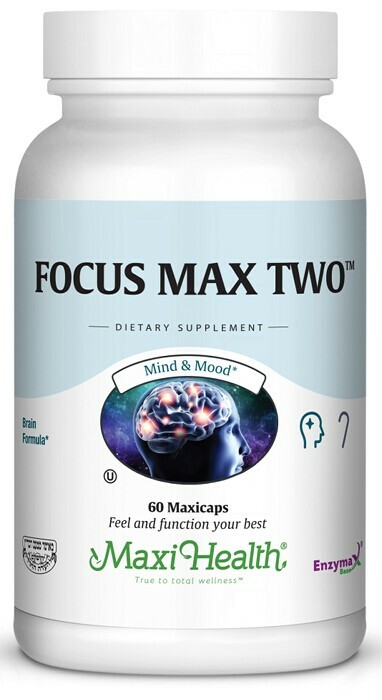 Give some thought to making Focus Max Two™ a part of your day! Take two (2) MaxiCaps™ daily with meals, or as directed. For best results, take with Maxi Omega-3 Focus Formula™. Other Ingredients: Vegetable cellulose (capsule),microcrystalline cellulose, magnesium stearate, silicon dioxide, Enzymax® (calcium carbonate, bromelain, papain, lipase, amylase, protease, silica). If pregnant, nursing, taking blood thinning medication, or are being treated for any medical condition, consult your healthcare practitioner before using this product.